Many times due to eating oily foods or overeating, one can feel acid reflux. It is a condition when the acid from stomach enters esophagus and throat starts burning. This burning in the throat can cause queasiness, and sometimes heartburn. 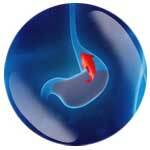 To get immediate relief from acid reflux, one needs to have antacids. If antacids are not immediately available, then taking some other measures can also solve the problem. The fastest solution to acid reflux is taking antacids. Other than taking liquid antacids, it is sometimes preferable to take powdered antacids, like Eno. It contains sodium bicarbonate. So, when it mixes with water, it creates a solution, which has a pH level higher than 7. Therefore, when it reacts with a weak acid, such as diluted hydrochloric acid in the stomach, Eno can neutralize it quickly. It can give one a fast relief from the problem. Moreover, it has no side effects. This has nearly the same composition as Eno. It also contains sodium bicarbonate. One can take a spoon of it and drink it with water. But, as it is not a regular medicine and it contains a high level of salt, therefore, one should not use it more than four times a day. Else, it can make the condition worse. It is safe to take it maximum four to five times a week. In a condition of acid reflux, one needs to get immediately over the feeling of inflammation in the throat. In such a state, Aloe Vera juice can give you an instant relief. Though it cannot act as a base for the acid in the stomach, it can bring down the burning pain. But, it also has a side effect. As it also acts as a purgative, so one should not drink it more than twice a day. If a base cannot neutralize the acid in the esophagus, something can dilute it. Secretion of extra saliva can solve the purpose. If one chews gum, at least, twenty minutes after the meal, then it will create extra saliva. It will gradually go down the esophagus, and clear the acid. However, one has to make sure that the gum is free of sugar. If one tries to sleep immediately after having a meal, then there are chances of having acid reflux. While lying down, the extra acid generated in the stomach can go down the throat, and create the reflux. Therefore, one should not sleep immediately after having a heavy meal. There are several other remedies to get immediate relief from acid reflux. Though this list is not a full one, this can give one a fair idea of the possible cures to this problem.